I'm not a specialist in technology so this isn't a technology review. I think of it as a kind of putting it through its paces in a real life family to see how it holds up! We are currently a 2 tablet family, 1 very old iPad which I love and 1 kindle fire which is fine and mostly be used by Noah. 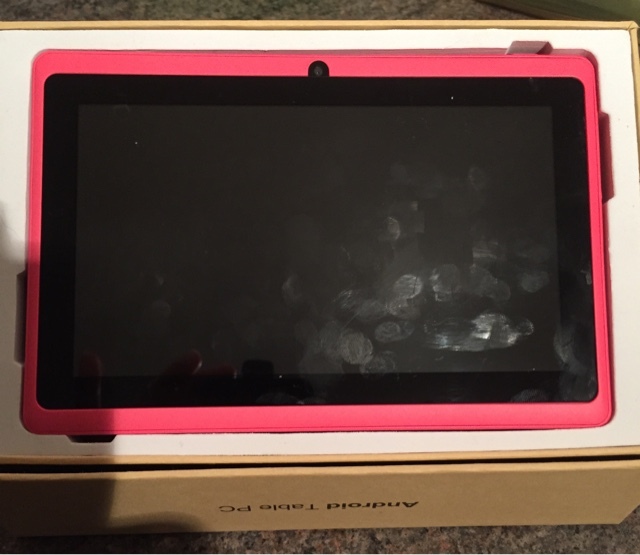 I wanted to get hold of a budget tablet to see the difference and selected this one which retails between £30 to £40 depending on where/when you get it. Firstly a big up to Amazon, ordered at about 7pm one day and arrives before lunch the next day. I made use of my prime membership to get it quickly but still that is quick. To read my review on Amazon prime click HERE. So what did we get, open opening that packaging I was quietly surprised with an attractive and robust looking tablet. I did have to snigger a little as the box said it was a table PC, might have missed the t off the end of that! Well, after a good look through the instructions and doing couple of minute simple set up its up and running! Wow, this is one fantastic tablet for the price, I've had it for over a week now and have really been putting it through its paces by downloading some apps, letting my 6 year old having a go on it, reading my kindle books on it. No issues so far. A couple of things to consider, the battery doesn't last long, BUT it doesn't take long to charge so that's a bonus. The camera is poor, but to be honest who uses the camera on a tablet. It's small but PERFECT for reading on. It can easily be slipped into your bag or pocket and is a standard size so you can easily pick up a cheap case for it for a few pounds. I set up my emails on it in seconds, whilst there aren't really clear instructions it's easy to work out if you are familiar with tablets or smartphones. I wouldn't say that I am an expert but did it easily. All together I'd say this tablet is great value for money. This is available £29.99 on Amazon click the product title below to just view the product listing, or shop now to buy on amazon (don't panic if you change your mind you have to click to confirm!) available in multiple colours but I got pink! If you click through my link it is a referral, any pennies I earn go to the running of this site and I appreciate readers using my links. This is an honest review of the item that I got from Amazon, I was not rewarded in any way for writing this review. A great review. I had no idea tablets had become so inexpensive. I know it's shocking how little they cost and how robust they are for the money. Great for kids for Christmas.